BUENOS AIRES, Argentina—After years of international isolation, Argentina is officially back — with the hosting of the World Economic Forum (WEF) on Latin America in Buenos Aires on April 6 and 7. “Argentina was isolated for 30 years; all that brought was more poverty,” Argentine President Mauricio Macri said at the opening conference of the forum on April 6. After the default on its public debt in 2001, Argentina, under the presidencies of Nestor Kirchner and his wife and successor Cristina Kirchner, fought with international creditors and shunned global institutions like the International Monetary Fund (IMF). President Macri, who was elected on a reform platform in 2015, vowed to make the country competitive again, and also to open it up to international investors. Hosting an international event like the WEF is the last in a series of steps to reintegrate Argentina on the global scene. “The way to go is intelligent integration into the world. We think that’s the path to growth and quicker, faster development,” Macri said. The first steps were taken in 2016 when Argentina launched a $16.5 billion U.S. dollar bond issue after repaying creditors from the 2001 default. 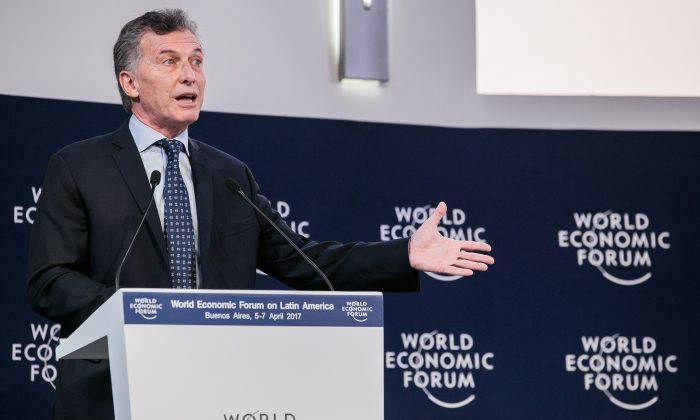 “[Macri] put Argentina back on the geoeconomic and geopolitical map,” said Klaus Schwab, the founder and executive chairman of the WEF at the same conference. Like every reformer, however, Macri is facing domestic headwinds as growth has remained tepid at 0.5 percent in the fourth quarter of 2016, and inflation remains rampant at 2.5 percent per month, or about 30 percent per year. Macri had removed subsidies on electricity and other utilities, leading to an increase in prices. Although he did not mention details on how his government intended to combat inflation, an increase in productivity would reduce the pressure on prices, which in many cases are as high as in New York City. Infrastructure investment and deregulation are other building blocks to boost productivity, he said. Macri did not mention this important variable. According to the Argentinian central bank, as of February the supply of money had grown at a rate of 31.2 percent from last year. Macri will have to address this issue as he pleads for more time to complete the economic turnaround.